The men’s basketball team, under second-year head coach Caleb Williams, tied for ninth in the Wolverine-Hoosier Athletic Conference standings in finishing 10-20 overall and 6-14 in the WHAC. Nine of those losses were by nine points or less. Senior forward Willis Mackey, Jr. was selected Second Team All-WHAC as he averaged 16.6 points and 8.9 rebounds per game this season while shooting 54 percent from the field and 79 percent at the foul line. He led the team in overall rebounds (161) and was third in points (298) despite missing 12 games midway through the season due to a knee injury. Chosen as the WHAC Player of the Week on February 11, Mackey posted eight double-doubles on the season, including a career high 30 points and 18 rebounds in a double overtime win at Lourdes on February 9. Freshman guard Zach Montes was chosen to the All-Freshman Team as he led UNOH with 455 points on the season, averaging 15.2 points per game while shooting 44 percent from the field and 78 percent at the foul line. Montes also ranked fourth in the conference in steals per game at 1.57. Mackey and senior center Ander Perez were each named to the All-Academic Team. The women’s basketball team, led by fourth-year head coach Mike Armbruster, tied for seventh in the Wolverine-Hoosier Athletic Conference standings as they finished 10-21 overall and 6-14 in the WHAC. Junior forward Fataya Larry was named Second Team All-WHAC as she finished seventh nationally in total rebounds (330), eighth in offensive rebounds per game (3.90), ninth in total rebounds per game (10.6) and 16th in defensive rebounds per game (6.74). Larry posted 13 double-doubles on the season, nine coming during conference play, and also averaged 10.5 points per game while shooting 50 percent from the field. Sophomore guard Emily Patton was also selected to the Second Team as she was sixth in the conference in scoring at 13.8 points per game and was third in the conference and 32nd nationally in free throw percentage (.827). Named the WHAC Player of the Week on November 12, she scored a career-high 31 points against Wilberforce on November 6, connecting on 18 of 21 foul shots in the process. Under third-year head coach Tyler Sosby, the Racer bowling teams competed as an independent this season. The men won the Thomas Burris Memorial and Eagle Classic tournaments and placed second in four other tournaments while the women placed in the top 10 in seven tournaments. 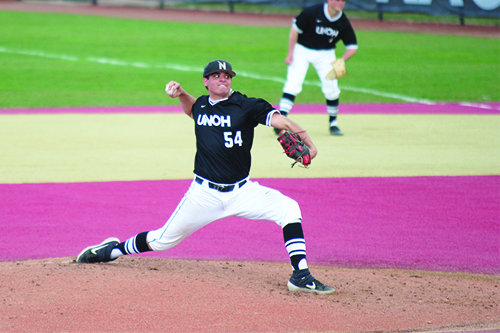 In just its eighth year as a program, the UNOH baseball team made its first-ever appearance at the NAIA World Series in Lewiston, Idaho, in 2018, defeating #3 St. Thomas of Florida in the process. Head coach Kory Hartman, a NAIA Regional Coach of the Year last season, returns several players from the squad, including senior pitcher Olivier Mailloux, who was an Honorable Mention All-American and the WHAC Pitcher of the Year as he ranked sixth nationally in wins with an 11-3 record and was fifth in strikeouts with 77. Senior catcher Misael Lebron was a Second Team All-WHAC selection last season as he hit .315 with six home runs and 27 RBI last season. The NAIA opening round, which the Racers won last season in Williamsburg, Kentucky, will take place May 13-16 with the World Series set for May 24-31. The Racer softball team tied the school record for wins in a season (31) in 2018 and advanced to its first NAIA Tournament by winning four straight games to take the WHAC Tournament title, with three of the wins coming by one run. 16 players return in 2019, including two named First Team All-WHAC in 2018 in junior pitcher Aubrey Brunst and junior outfielder Joey Brinegar. Brunst posted a 17-9 record with a 1.65 earned run average as the ace of the pitching staff, striking out 63, while Brinegar hit .333 as she led the team with 39 RBI, 22 of those coming in conference play. Two players that were selected Second Team All-WHAC last season also return in senior pitcher Hunter Conzelmann and junior outfielder Grace Jackson. Conzelmann posted a 13-5 record with a 2.89 earned run average and 59 strikeouts in 116.1 innings, while Jackson hit .358 with three home runs, 25 RBI and 11 doubles and led the team with 35 runs scored. The NAIA opening round will take place May 13-15 with the World Series set for May 23-29 in Springfield, Missouri. Heading into the spring portion of their schedule, the men’s golf team is ranked #3 in the NAIA Coaches Poll and received one first-place vote. During the fall, UNOH finished first in six tournaments and placed second in the other as five different players (Tom Froom twice, Lewis Scott, Reece Blair, Gonzalo Garcia-Parada and Josh Beatt) earned medalist honors. The Racers will compete in four tournaments, including hosting the UNOH Spring Invitational on April 19, before competing in the WHAC Championship April 23-24 in Augusta, Michigan. The NAIA Championship is set for May 21-24 in Mesa, Arizona. The women’s golf team is ranked #21 in the NAIA Coaches Poll as it begins the spring portion of the schedule. UNOH finished second to Indiana Tech during the Wolverine-Hoosier Athletic Conference regular-season as senior Caitriona Griffin, sophomore Devaki Ganesh and junior Natalia Quintero earned First Team All-WHAC honors while freshmen Hastha Rajendran and Haleigh Gray were selected to the Second Team. The Racers will compete in three tournaments, before competing in the WHAC Championship April 26-27 in Augusta, Michigan. The NAIA Championship is set for May 14-17 in Oklahoma City, with Griffin already qualifying for the tournament after earning Third Team All-American honors at last year’s championship. UNOH, looking to win the WHAC regular-season and tournament titles for the fifth consecutive season, has a strong nucleus returning, led by senior Radu Popa, who won the singles crown at the ITA Midwest Regional in the fall and finished third at the Oracle Cup, a tournament featuring the top players in the country. The WHAC Tournament will be played on campus sites, with the finals set for April 27. The NAIA Tournament is set for May 14-18 in Mobile, Alabama. Only two players return for the women’s tennis team this season, but one is Camila Puente, who earned Honorable Mention All-American and All-WHAC honors as a freshman. Like the men’s tournament, the WHAC Women’s Tournament will be played on campus sites, with the finals set for April 26. The NAIA Tournament is set for May 14-18 in Mobile, Alabama.